Storage Instructions Cacao beans keep well in cool, dry conditions. 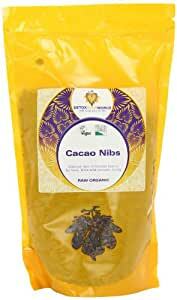 Cacao nibs are very easy to pour into smoothies and other delights. You can eat them straight or in a trail mix. Try sprinkling on your breakfast. Add to a touch of agave nectar or another sweetening agent and chew. Freeze cacao beans with sweeteners. Eat cold. Blend cacao nibs into herbal teas with the Peruvian ecstatic food maca. Crush cacao nibs with a pestle and mortar and add to raw ice creams for the best chocolate chips in the world. Create a raw chocolate bar. Blend the following raw ingredients together: cacao nibs, agave nectar, carob powder, maca, coconut oil, cacao butter, angstrom calcium and cashews. Pour into a mould and freeze. Eat cold and experience the truth about the food of the gods. All was delivered in good time and packaged with great care. Cacao has an interesting taste but tastes nice with Goji berries.